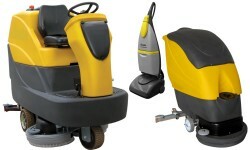 Scrubber Dryers are easy to store and to manoeuvre around the home or office. Vacuum intake at the rear ensures efficient easy cleaning of heavy traffic areas in shops, restaurants, hotels, and service stations etc. where working space is restricted. They feature an ergonomic handle, detachable detergent and recovery tanks, cable holder and twin squeegees for both forward and reverse scrubbing and drying. Cleaning efficiency is optimised with three controls for brush drive, washing and drying operations.